Climb to the summit's peak as a pack of wolves lead you to riches in the new Wolf Ridge slot by IGT. Bask in the glow of the Northern Lights and enjoy the howling big wins in this 30-line slot machine. Rich rewards abound in the snow fields when the Bonus Scatter symbols appear on reels 1, 3 and 5 and trigger the Prize Disk feature, where each triggering symbol pays a bonus win or awards free spins. 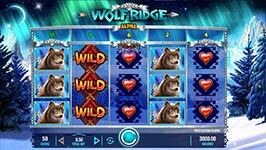 Climb to the summit’s peak as a pack of wolves lead you to riches in the new Wolf Ridge slot by IGT. Bask in the glow of the Northern Lights and enjoy the howling big wins in this 30-line slot machine. Rich rewards abound in the snow fields when the Bonus Scatter symbols appear on reels 1, 3 and 5 and trigger the Prize Disk feature, where each triggering symbol pays a bonus win or awards free spins. Prize Disk Feature – The Prize Disk feature is triggered when a Bonus scatter symbol appears on the reels. These symbols appear on reels 1, 3 and 5 in the base game and on all reels in the Free Spins Bonus. Each triggering bonus scatter symbol pays a bonus win or awards free spins as shown in the Prize Disk position above the triggering symbol. on each spin, the awards in the Prize Disk shift one reel to the left, introducing a different award in the Prize Disk position above the fifth reel. Free Spins Bonus – The free spins bonus is triggered when one or more free spins symbols are awarded from the Prize Disk feature. Each triggering Free Spins symbol awards 10 free spins. The reels in the Free Spins Bonus are richer than the base game reels, with more Bonus symbols added to the reels.